Indeed, nearly two-thirds of Muslim Americans say they are dissatisfied with the way things are going in the U.S. today. And about three-quarters say Donald Trump is unfriendly toward Muslims in America. 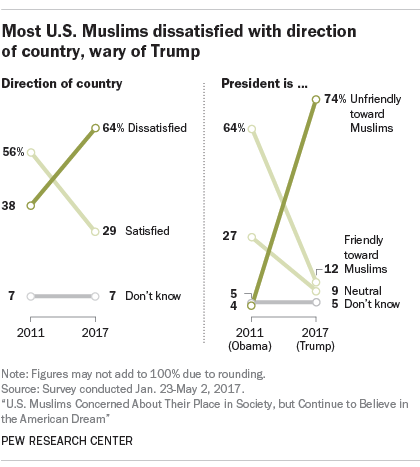 On both of these counts, Muslim opinion has undergone a stark reversal since 2011, when Barack Obama was president, at which point most Muslims thought the country was headed in the right direction and viewed the president as friendly toward them. The new survey asked U.S. Muslims about a wide variety of topics, including religious beliefs and practices, social values, views on extremism and political preferences. While the survey finds that a majority disapprove of the way Trump is handling his job, this is not the first time the community has looked askance at a Republican in the White House. Indeed, Muslim Americans are no more disapproving of Trump today than they were of George W. Bush’s performance in office during his second term a decade ago. And while Muslims say they face a variety of challenges and obstacles in the U.S., this too is nothing new. The share of U.S. Muslims who say it is getting harder to be a Muslim in America has hovered around 50% over the past 10 years. Over the same period, half or more of Muslims have consistently said that U.S. media coverage of Muslims is unfair. The Muslim population in the U.S. is growing and highly diverse, made up largely of immigrants and the children of immigrants from all across the world. Indeed, respondents in the survey hail from at least 75 nations – although the vast majority are now U.S. citizens. As a group, Muslims are younger and more racially diverse than the general population. Muslims also are quite varied in their religious allegiances and observances. Slightly more than half of U.S. Muslims are Sunnis (55%), but significant minorities identify as Shiite (16%) or as “just Muslim” (14%). Most Muslims say religion is very important in their lives (65%), and about four-in-ten (42%) say they pray five times a day. But many others say religion is less important to them and that they are not so consistent in performing salah, the ritual prayers that constitute one of the Five Pillars of Islam and traditionally are performed five times each day. The survey also shows that Muslims largely share the general public’s concerns about religious extremism. Indeed, if anything, Muslims may be more concerned than non-Muslims about extremism in the name of Islam. 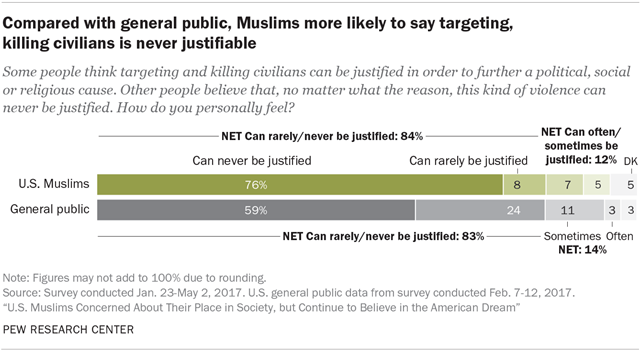 Yet most Muslims say there is little support for extremism within the U.S. Muslim community, and few say they think violence against civilians can be justified in pursuit of religious, political or social causes. Muslims concerned about extremism, both globally and in U.S. Overall, eight-in-ten Muslims (82%) say they are either very concerned (66%) or somewhat concerned (16%) about extremism in the name of Islam around the world. 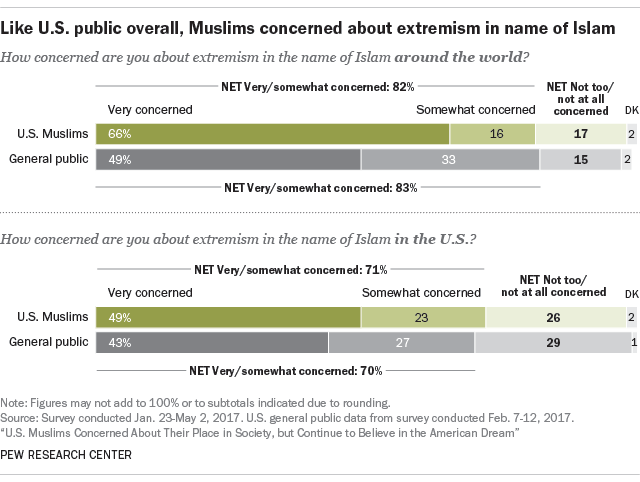 This is similar to the percentage of the U.S. general public that shares these concerns (83%), although Muslims are more likely than U.S. adults overall to say they are very concerned about extremism in the name of Islam around the world (66% vs. 49%). About seven-in-ten Muslims – and a similar share of Americans overall – are concerned about extremism in the name of Islam in the U.S., including roughly half of U.S. Muslims (49%) who say they are very concerned about domestic extremism. Among both Muslims and the larger U.S. public, concern about extremism around the world is higher now than it was in 2011 (see Chapter 5 for details on trends over time). While concern about extremism has risen, there is little change in perceptions of how much support for extremism exists among Muslims in the United States. Nearly three-quarters of U.S. Muslims (73%) say there is little or no support for extremism among American Muslims, while about one-in-six say there is either a “fair amount” (11%) or a “great deal” (6%) of support for extremism within the U.S. Muslim community. When is killing civilians seen as justifiable? To better understand what some people had in mind when answering this question about targeting and killing civilians for political, social or religious reasons, Pew Research Center staff called back a small number of respondents and conducted non-scientific follow-up interviews. Many respondents – both Muslims and non-Muslims – who said violence against civilians can sometimes or often be justified said they had in mind situations other than terrorism, such as military action or self-defense. For more details on this question, see Chapter 5. While U.S. Muslims are concerned about extremism and overwhelmingly opposed to the use of violence against civilians, they also are somewhat mistrustful of law enforcement officials and skeptical of the integrity of government sting operations. About four-in-ten U.S. Muslims (39%) believe most Muslims who have been arrested in the U.S. on suspicion of plotting terrorist acts posed a real threat. But three-in-ten (30%) say law enforcement officers have arrested mostly people who were tricked and did not pose a real threat. And an additional three-in-ten volunteer that “it depends” or offer another response or no response. Views on this topic among the general public are less divided: A majority of U.S. adults (62%) say officers in sting operations have mostly arrested people who posed a real threat to others. Meanwhile, about a third of Muslim Americans say they are either very worried (15%) or somewhat worried (20%) that the government monitors their phone calls and emails because of their religion. However, on a different question – which does not mention religion – Muslims actually are less likely than Americans overall to think the government is monitoring them: About six-in-ten Muslims (59%) say it is either very likely or somewhat likely that the government monitors their communications, compared with 70% of the general public. In addition to gauging broad concerns about discrimination, the survey also asked Muslims whether they personally have experienced a few specific kinds of discrimination within the past year. 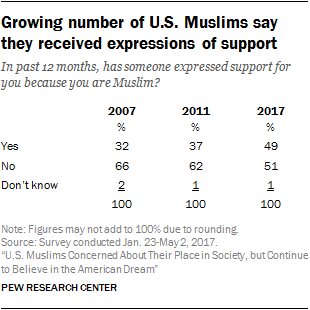 The share of U.S. Muslims who say they have faced at least one of these types of discrimination has risen modestly in recent years. About a third of Muslims, for example, say they have been treated with suspicion over the past 12 months because of their religion. Nearly one-in-five say they have been called offensive names or singled out by airport security, while one-in-ten say they have been singled out by other law enforcement officials. And 6% say they have even been physically threatened or attacked. In total, nearly half of Muslims (48%) say they have experienced at least one of these types of discrimination over the past year, which is up slightly from 2011 (43%) and 2007 (40%). In addition, nearly one-in-five U.S. Muslims (18%) say they have seen anti-Muslim graffiti in their local community in the last 12 months. Experiences with discriminatory treatment are especially common among those whose appearance identifies them as Muslim. Overall, about four-in-ten Muslims (38%) – including half of Muslim women (49%) – say that on a typical day, there is something distinctive about their appearance, voice or clothing that people might associate with Muslims. Of those whose appearance is identifiably Muslim, nearly two-thirds (64%) say they have experienced at least one of the specific types of discrimination asked about in the survey. 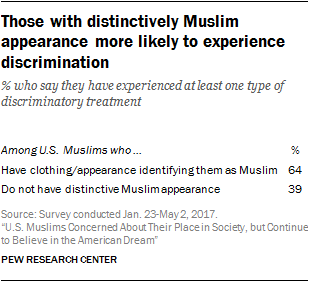 Among Muslims who say they do not have a distinctively Muslim appearance, fewer report these types of experiences (39%). While roughly half of Muslims say they have experienced a specific instance of discrimination over the past year, a similar share (49%) say someone has expressed support for them because they are Muslim in the past 12 months. The percentage of U.S. Muslims who report this type of experience is up significantly since 2011 (37%) and 2007 (32%). About three-quarters of Muslim Americans (74%) say the nation’s new chief executive is unfriendly toward their group, while two-thirds (65%) say they disapprove of the way Trump is handling his job as president. 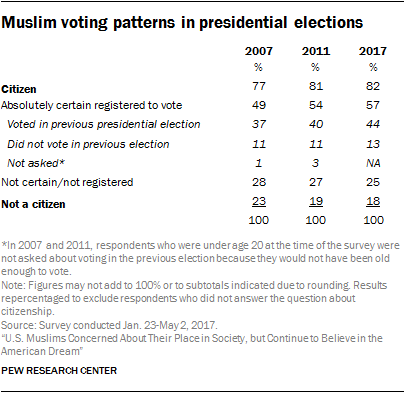 U.S. Muslim opinion on the sitting president has turned dramatically since 2011, when Muslims expressed much more positive views of Barack Obama. In 2007, near the end of his second term, George W. Bush received approval ratings from U.S. Muslims that were about as low as Trump’s today. Respondents in that survey were not asked whether they thought Bush was friendly toward Muslim Americans. In the new survey, respondents were asked whether Trump makes them feel four emotions – two positive (hope and happiness) and two negative (worry and anger). Fully two-thirds of Muslim Americans (68%) say the president makes them feel worried, and 45% say he makes them feel angry. Far fewer say the president makes them feel hopeful (26%) or happy (17%). Muslim Americans are less likely than the public as a whole to say Trump makes them feel hopeful (26% vs. 40%) or happy (17% vs. 30%), but about as likely to say Trump makes them feel worried or angry. U.S. Muslims express pride in their religious and national identities alike. Fully 97% agree with the statement, “I am proud to be Muslim.” Nearly as many (92%) say they agree with the statement, “I am proud to be an American.” In total, 89% agree with both statements, saying they are proud to be Muslim and proud to be American. 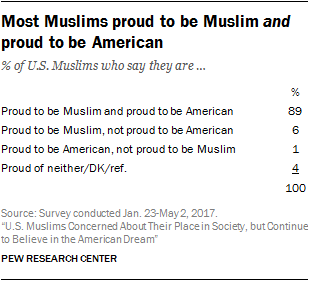 Just 6% say they are proud to be Muslim and not proud to be American, and 1% say they are proud to be American and not proud to be Muslim. 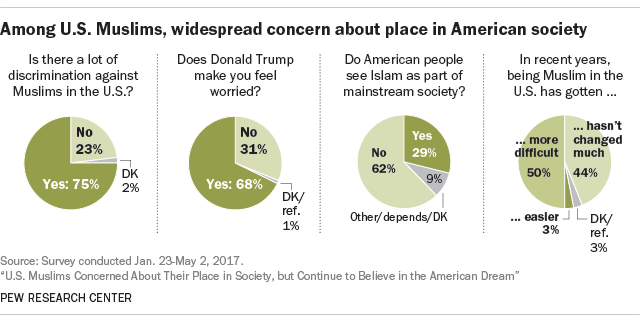 At the same time, many Muslims say they face a variety of significant challenges in making their way in American society. 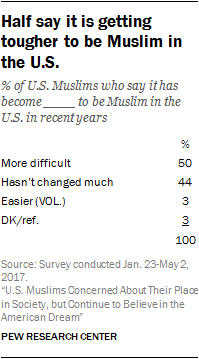 Fully half say that it has become more difficult to be Muslim in the U.S. in recent years, and an additional 44% say the difficulty or ease of being Muslim has not changed very much. Just 3% volunteer that it has become easier to be Muslim in America. Most Muslims (60%) also perceive media coverage of Muslims and Islam as unfair, and a similar share (62%) think the American people as a whole do not see Islam as part of mainstream American society. These views are largely echoed by U.S. adults overall, many of whom agree that media coverage of Muslims is unfair and say they personally do not see Islam as part of mainstream society. But tension is not the only thing that defines the relationship between Muslims and the rest of the U.S. population. Six-in-ten U.S. Muslims say they have a lot in common with most Americans. And Muslims are much more likely to say the American people, in general, are friendly toward Muslims in the country (55%) than to view Americans as a whole as unfriendly (14%). (Three-in-ten say Americans are generally neutral toward Muslims.) Moreover, U.S. Muslims have become slightly more likely to view the American public as friendly toward them since 2011, when 48% took this position. The survey finds a consistent gender gap on several questions about what it is like to be a Muslim in America, showing that Muslim women have a higher level of concern than Muslim men about the place of Muslims in U.S. society. For example, more Muslim women than men say that there is a lot of discrimination against Muslims in the U.S. today, that they have personally experienced discrimination and that it has become more difficult to be Muslim in the U.S. in recent years. In addition, more Muslim women than men say Donald Trump makes them angry or worried, and more women than men say both Trump and the Republican Party are unfriendly toward Muslim Americans. Muslim women are more likely than Muslim men to say that they are dissatisfied with the way things are going in the country and that media coverage of Muslims is unfair. Meanwhile, more Muslim men than women say that they have a lot in common with most Americans and that the American people in general are friendly toward Muslim Americans. 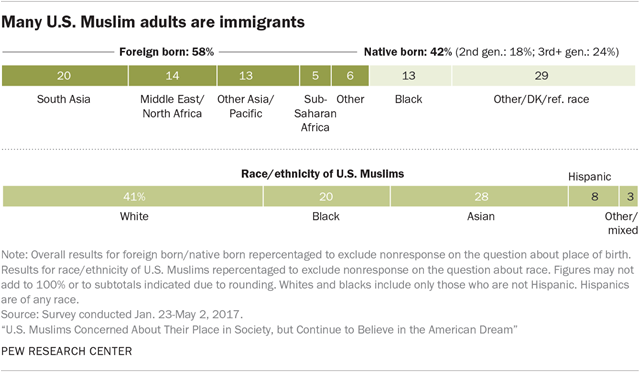 Muslim Americans are largely an immigrant population: Roughly six-in-ten U.S. Muslims ages 18 and over (58%) were born outside the U.S., with origins spread throughout the world. The most common region of origin for Muslim immigrants is South Asia, where one-in-five U.S. Muslims were born, including 9% who were born in Pakistan. An additional 13% of U.S. Muslims were born elsewhere in the Asia-Pacific region (including Iran), 14% in the Middle East or North Africa, and 5% in sub-Saharan Africa. Due in no small part to their wide range of geographic origins, U.S. Muslims are a racially and ethnically diverse population. No single racial group forms a majority, with about four-in-ten Muslim adults (41%) identifying as white (including Arabs and people of Middle Eastern ancestry), 28% identifying as Asian (including people of Pakistani or Indian descent) and one-in-five identifying as black or African American. The data also show that Muslim Americans are a very young group. 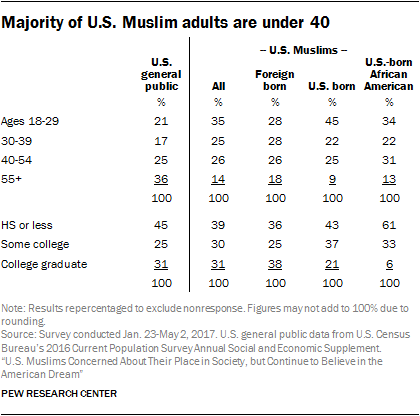 Most Muslim adults (60%) are under the age of 40. By comparison, just 38% of the U.S. adult population as a whole is younger than 40. The diversity of Muslims in the U.S. extends to religious beliefs and practices as well. While nearly all Muslims say they are proud to be Muslim, they are not of one mind about what is essential to being Muslim, and their levels of religious practice vary widely. Most U.S. Muslims (64%) say there is more than one true way to interpret Islam. They also are more likely to say traditional understandings of Islam need to be reinterpreted in light of modern contexts (52%) than to say traditional understandings are all that is needed (38%). Muslims also were asked whether each of eight actions and behaviors is an “essential” part of what being Muslim means to them, an “important but not essential” part or “not an important” part. Fully 85% of Muslims say believing in God is essential to what being Muslim means to them, more than say the same about any other item in the survey. And nearly three-quarters say “loving the Prophet Muhammad” is essential to what being Muslim means to them. Yet many U.S. Muslims say that for them, personally, being Muslim is about more than these core religious beliefs. 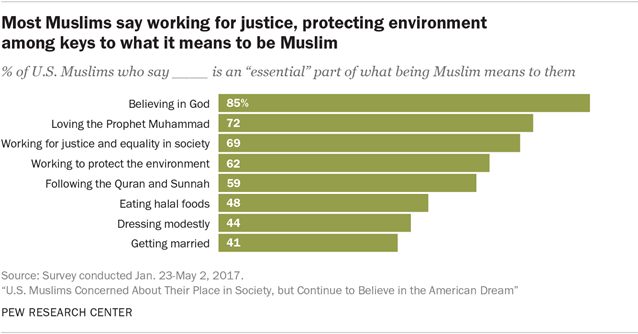 Roughly seven-in-ten, for instance, say “working for justice and equality in society” is an essential part of their Muslim identity, and 62% say the same about “working to protect the environment” – which is higher than the share of U.S. Christians who said protecting the environment is essential to their Christian identity in response to a similar question (22%). American Muslims, like the U.S. public as a whole, have become much more accepting of homosexuality in recent years. In the first Pew Research Center survey of Muslims, in 2007, far more Muslims said homosexuality should be discouraged by society (61%) than said it should be accepted (27%). By 2011, Muslims were roughly evenly split on this question. Today, Muslims who say homosexuality should be accepted by society clearly outnumber those who say it should be discouraged (52% vs. 33%). While Muslims remain somewhat more conservative than the general public on views toward homosexuality, they are more ideologically liberal than U.S. adults overall when it comes to immigration and the size of government. 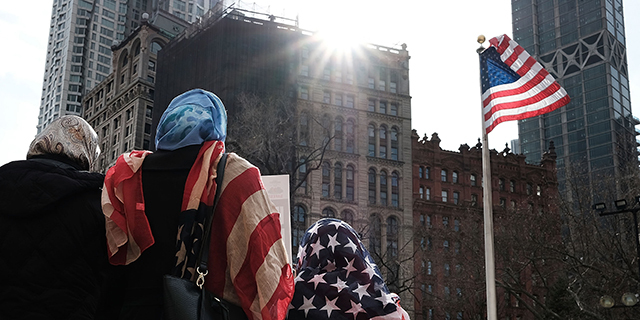 About eight-in-ten U.S. Muslims believe that immigrants strengthen the country with their hard work and talent (79%), which is perhaps not surprising, given that most Muslims are themselves immigrants. And two-thirds of Muslim Americans (67%) say they prefer a larger government that provides more services over a smaller government that provides fewer services. On some other issues, the views of U.S. Muslims mirror those of the larger public. Like Americans overall, most Muslims rank being a good parent as “one of the most important things” in their lives, and they tend to rate having a successful career and living a very religious life as at least somewhat important but not necessarily among the most important things in life. 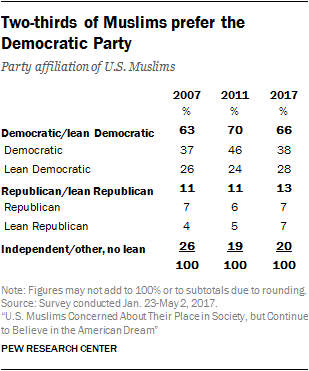 Two-thirds of U.S. Muslims either identify as Democrats or lean toward the Democratic Party; far fewer (13%) identify as Republican or lean toward the GOP. Muslims favored the Democratic Party over the GOP by comparable margins in both previous Pew Research Center surveys. When asked how they voted in last year’s presidential election, three-quarters of Muslim voters (78%) say they backed Hillary Clinton, 8% say they voted for Trump, and 14% say they voted for another candidate or decline to say how they voted. 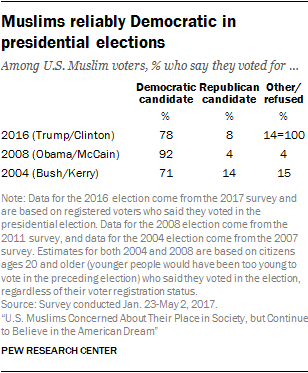 Clinton’s 70-point margin of victory over Trump among Muslims falls short of Barack Obama’s margin over John McCain; in the 2011 survey, 92% of U.S. Muslim voters said they cast ballots for Obama in 2008, compared with just 4% who reported voting for McCain. In 2007, 71% of U.S. Muslims said they voted for John Kerry in 2004, compared with 14% who voted for George W. Bush. Two-thirds of Muslims (65%) say they do not think there is a natural conflict between the teachings of Islam and democracy, while three-in-ten say there is an inherent conflict between Islam and democracy. See, for example: R.W. Dec. 15, 2015. “American Muslims in New Jersey talk about Donald Trump.” The Economist. Pérez-Peña, Richard, and Laurie Goodstein. Nov. 18, 2016. “Muslim Americans Speak of Escalating Worries.” The New York Times. Shane Scott, Matthew Rosenberd and Eric Lipton. Feb. 1, 2017. “Trump Pushes Dark View of Islam to Center of U.S. Policy-Making.” The New York Times.